On Nut – Watching through almost an hour of seemingly futile efforts, the home crowd began wondering if there was even any desire to win on the court. However, Kanny Smith dispelled any doubt by canning a short shot to tie the game with just 6 seconds left in regulation, forcing overtime in the Under-13 Girls Basketball regular season championship game. The game started with the home team doing what it does best – defend. Holding St. Andrew’s to 0 points in the first quarter, the Seahawks led 7-0 behind the shooting of Kanny and grade 8 twins Ramita and Ruchika. 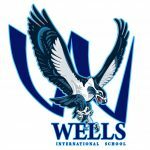 However, cold shooting by Wells, along with the scrappy playing of the smaller, but quicker, visitors, allowed St. Andrew’s to claw their way back to tie the game, 10-10, by the end of the third quarter, and eventually taking the lead, 12-10, early in the fourth quarter. That lead held as the Seahawks squandered opportunity after opportunity, including three straight fruitless trips to the free-throw line. However, the visitors seemed to suffer from the same malady, unable to convert on numerous steals and offensive rebounds, allowing for the late game heroics by Wells’ eighth-grade captain. In overtime, frustration finally turned into jubilation as the young Lady Seahawks woke up and turned the power up a notch to score 6 straight points and outlast St. Andrew’s to claim their first TISAC championship. 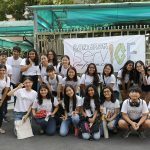 This is just the Seahawk’s second year as members of Bangkok’s largest international school athletic conference. Leading all scorers was Kanny with 9 points, followed by eighth-grader Ramita with 6 points, including 4 pivotal points in overtime. The Lady Seahawks will now prepare for the season-ending TISAC tournaments being held next week Tuesday, November 24, at St. Stephen’s International School. 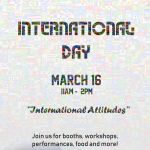 Join us for International Day on March 16!